In a small bowl, whisk together brown sugar, soy sauce, chili sauce, and rice wine vinegar. Cook udon noodles according to package. Drain and set aside. In a medium skillet (nonstick works best), melt butter over medium heat. Once melted, add egg and scramble lightly. When egg is almost cooked, season with a pinch of red pepper flakes and add sauce to the skillet. Cook for 20 seconds so sauce can reduce slightly. Add udon noodles to skillet and toss everything to combine. Serve immediately and garnish dish with fresh cilantro and chopped scallions. 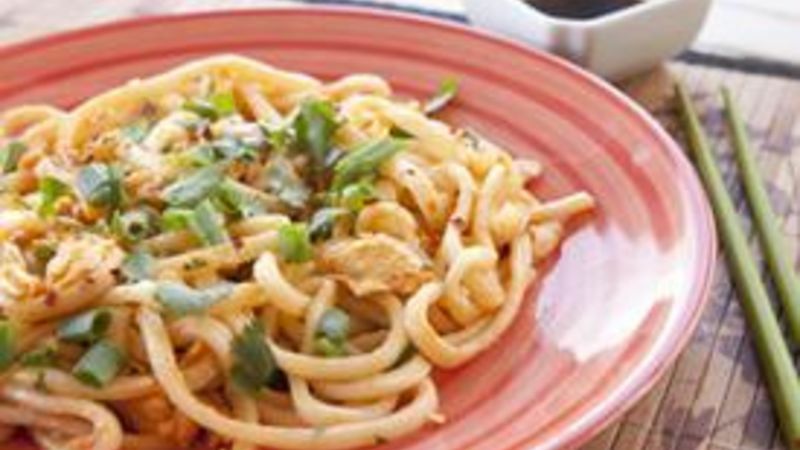 These noodles may look unassuming, but they pack a bit of a punch. They might leave you breathing fire after you’re done with them! If you like spicy food, these dragon noodles are the meal for you. And they only take about fifteen minutes to make—hard to beat that. Since this meal cooks very quickly, it’s important to have all your ingredients ready to go before you start cooking. Start by whisking your sugar, soy sauce, chili sauce, and vinegar together in a small bowl. This will be the sauce for the noodles. It’s pretty spicy, but it’s also the perfect balance of sour, salty, and sweet. Also, whisk your egg well so it’s ready to go when needed. You could use a lot of different noodles for this dish, but I like fresh udon noodles, which you should be able to find in the refrigerated section of your store. Any Asian grocery will carry them for sure, but I found mine in a normal grocery store. If the noodles come with a spice packet of some sort, just toss it. We’re making our own seasonings! Cook the noodles according to the packaging, which should only take a few minutes in boiling water. Drain them and set them aside. Everything goes fast from here. Melt your butter in a medium nonstick skillet and once it’s melted, stir in your egg over medium heat. Cook it until the egg is scrambled and almost cooked through. Then season the eggs with a pinch of red pepper flakes and add your sauce to skillet. It’ll sizzle and hiss. Then toss in your drained noodles and stir everything together to coat the noodles with the sauce. Do this all over the heat so the noodles reheat in the pan and the sauce reduces slightly as it cooks. Serve this immediately with some fresh cilantro and chopped scallions. This recipe serves one person, but as you can imagine it’s very easy to double or even quadruple. Become one with the dragon and give this noodle dish a try! Nick is happy that he didn’t have to actually slay a dragon to make these. Be sure to check out his blog, Macheesmo, and follow him on his Tablespoon Profile.